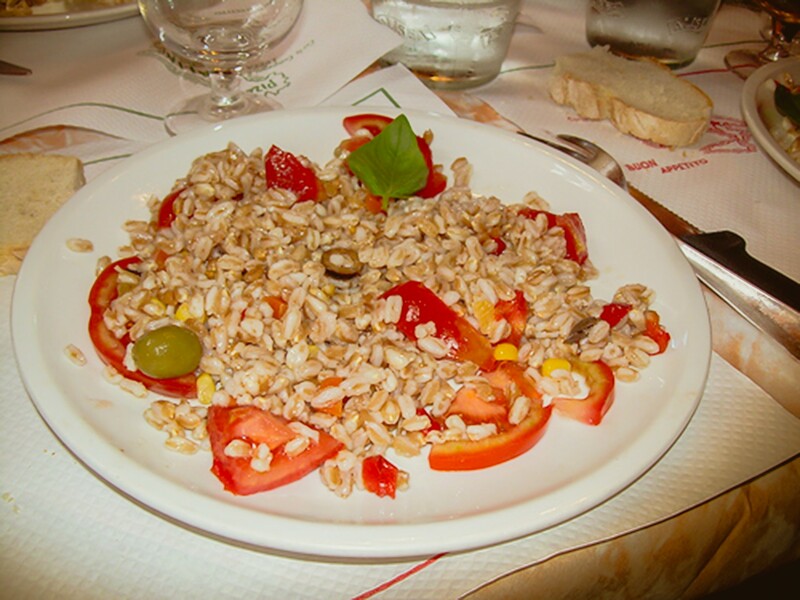 Insalata di farro is Lucca’s most prominent summer dish. In a lunch box on the beach, as an aperitif accompanier – it has endless variations and combinations. We add to our traditional cereal -the spelt grows on the nearby Garfagnana mountains -fresh veggies, sausages, dices of mozzarella … Whatever we found in the kitchen and fits our summer eating mood: a fresh and light local salad that makes a great Primo or side dish. Wash well the spelt in cold water. Put the spelt in a pot, cover with water about 5 cm above spelt, bring to boil, reduce flame and cook until spelt is soft yet crunchy. Drain the water, immediately add olive oil and stir well. Set aside to cool, stirring occasionally. In a bowl mix all veggie . Add the cold spelt, nuts, season with salt, pepper , olive oil and lemon juice. Serve cold or in room temperature.